Not to be confused with Kingdom of Serbia (medieval) or Kingdom of Serbia (1718–39). "With faith in God, for King and Fatherland"
The Kingdom of Serbia in 1913. The Kingdom of Serbia (Serbian: Краљевина Србија / Kraljevina Srbija), often rendered as Servia in English sources during the time of its existence, was created when Prince Milan I of Serbia, ruler of the Principality of Serbia, was crowned king in 1882. Since 1817 the Principality was ruled by the Obrenović dynasty (replaced by the Karađorđević dynasty for a short time). The Principality, suzerainty of the Ottoman Empire, de facto achieved full independence when the last Ottoman troops left Belgrade in 1867. The Congress of Berlin in 1878 recognized the formal independence of the Principality of Serbia. In 1882 King Milan I proclaimed a kingdom and maintained a foreign policy friendly to Austria-Hungary. Between 1912 and 1913 Serbia greatly enlarged its territory through engagement in the First and Second Balkan Wars - Sandžak-Raška, Kosovo Vilayet and Vardar Macedonia were annexed. As outcome of the World War One in 1918 it united with Vojvodina and Kingdom of Montenegro. Towards the end of 1918, Serbia joined with the newly created State of Slovenes, Croats and Serbs to form the new Kingdom of Serbs, Croats and Slovenes (later known as Kingdom of Yugoslavia) under the continued rule of the Serbian Karađorđević dynasty. At first, the principality included only the territory of the former Pashaluk of Belgrade, but in 1831-1833 it expanded to the east, south, and west. In 1867 the Ottoman army left the Principality, securing its de facto independence. 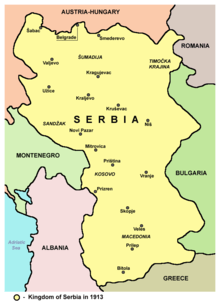 Serbia expanded further to the south-east in 1878, when it won full international recognition at the Congress of Berlin. In 1882 it was raised to the level of the Kingdom of Serbia. 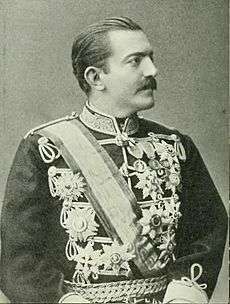 King Alexander I of Serbia and his unpopular wife Queen Draga, were assassinated inside the Royal Palace in Belgrade on the night of 28–29 May 1903. Other representatives of the Obrenović family were shot as well. This act resulted in the extinction of the House of Obrenović which had been ruling Serbia since 1817. After the May Coup Serbian Skupština invited Peter Karadjorjević to assume the Serbian crown as Peter I of Serbia. A constitutional monarchy was created with the military Black Hand society operating behind the scenes. The traditionally good relations with the Austria-Hungary ended, as the new dynasty relied on the support of the Russian Empire and closer cooperation with Kingdom of Bulgaria. On April 1904 the Friendship treaty and on June 1905 the customs union with Bulgaria were signed. In response Austria-Hungary imposed a Tariff War (Pig war) of 1906-1909. After the 1906 elections People's Radical Party came to power. In 1908 Austria-Hungary annexed Bosnia, where Serbia had hoped to expand its territory. The Bosnian Crisis of 1908–1909 (also referred to as the Annexation crisis) erupted into public view when on October 5, 1908, Kingdom of Bulgaria declared its complete independence from Ottoman Empire and on October 6, 1908, when Austria-Hungary announced the annexation of Bosnia and Herzegovina, which was populated mainly by South Slavs (Serbs and Croats). Between 1912 and 1922 Serbia was involved in a number of wars that brought it to the brink of total destruction and ended with renewed greatness. Victorious in two Balkan Wars, it gained significant territorial areas of the Central Balkans and almost doubled its territory. Territorial expansion of the Kingdom of Serbia in 1913. Negotiations between Russia, Serbia and Bulgaria led to the Serbian-Bulgarian Treaty of Alliance of March 1912 which aimed to conquer and to divode the Ottoman held Macedonia. On May Serbian-Greek alliance was reached and in October 1912 Serbia-Montenegro alliance was signed. After the war started, Serbia, together with Montenegro conquered Pristina and Novi Pazar. At the Battle of Kumanovo Serbians defeated Ottoman army and proceeded to conquer Skopje and the whole of Kosovo vilayet. The region of Metohija (known as the Dukagjini Valley to ethnic-Albanians) was taken by Montenegro. At Bitola and Ohrid Serbian army units established contact with the Greek army. 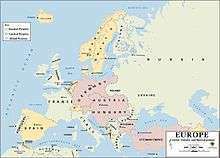 The final borders were ratified at the Treaty of Bucharest of 1913. Serbia came to control the land which became known as Vardar Macedonia, and today stands independent as the Republic of Macedonia but land-locked Serbia was prevented from gaining access to Adriatic Sea by the newly established Principality of Albania, while many ethnic Albanians remained within the new Serbian borders. As the result of these wars, Serbia's population increased from 2.9 million to 4.5 million and territory increased by 81%. The assassination of Archduke Franz Ferdinand of Austria on 28 June 1914 in Sarajevo (then part of the Austria-Hungary) brought the tensions between Austria-Hungary and Serbia to a head. Behind the assassination in Sarajevo was the secret Serbian officers organization Black Hand. The assassins were supported by an "underground railroad" of Serbian civilians and military officers that provided transportation and hid them; members of the Serbian military that trained them, encouraged them, and provided weapons, maps, and other information. After the assassination, the conspirators were arrested in Bosnia-Herzegovina and tried in Sarajevo in October 1914. On July 28, 1914 Austria-Hungary declared the war against Serbia. In 1915 Serbia was occupied by foreign troops after a combined invasion by Austro-Hungarian, German, and Bulgarian troops. The 135 000 soldiers of the Serbian army retreated through Albania and were evacuated to the Greek island of Corfu, and in spring 1916 they became part of a newly formed Salonika front. In 1916 Kingdom of Montenegro was conquered by Austria-Hungary. On December 1, 1918 Serbia united with the newly created State of Serbs, Croats and Slovenes to form a new Southern Slav state, the Kingdom of Serbs, Croats and Slovenes. 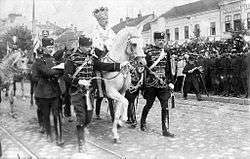 The new country continued to be ruled by the Serbian monarchy when on August 1921 Prince Alexandar I became the King. The Principality of Serbia in 1878. 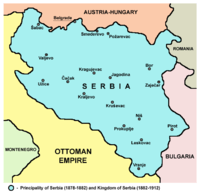 Short-lived territorial expansion of Serbia in 1912-1913, following the First Balkan War. Territorial expansion of Serbia 1913-1915, following the Second Balkan War. 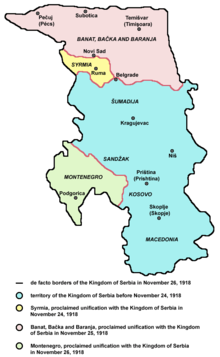 Serbia in 1918 (27 November - 1 December), following its annexation of Syrmia (24 November), Banat, Bačka and Baranja (25 November) and the Kingdom of Montenegro (27 November). ↑ Malcolm, Noel (26 February 2008). "Is Kosovo Serbia? We ask a historian". The Guardian. Wikimedia Commons has media related to Kingdom of Serbia. g Kosovo is the subject of a territorial dispute between the Republic of Kosovo and the Republic of Serbia. 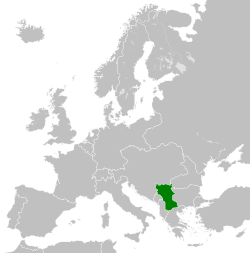 The Republic of Kosovo unilaterally declared independence on 17 February 2008, but Serbia continues to claim it as part of its own sovereign territory. The two governments began to normalise relations in 2013, as part of the Brussels Agreement. 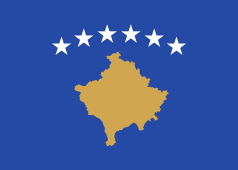 Kosovo has received recognition as an independent state from 110 out of 193 United Nations member states.